LEAWOOD, KS (June 13, 2015) – Each year at its annual conference, CARSTAR Auto Body Repair Experts recognizes the top CARSTAR owners and business groups throughout its network for their leadership and performance. Taking home the top honor as Franchisee of the Year was CARSTAR Jungerman in St. Peters, MO, owned by Kerry Woodson and Toni Donius. Franchisee of the Year is the highest award given in the CARSTAR system, and it represents the best of the best that is CARSTAR. This year’s winner was chosen on criteria such as using all vendors possible, attending the annual conference, being image compliant, submitting reports on time online, and delivering consistently high CSI for the month and quarterly periods. 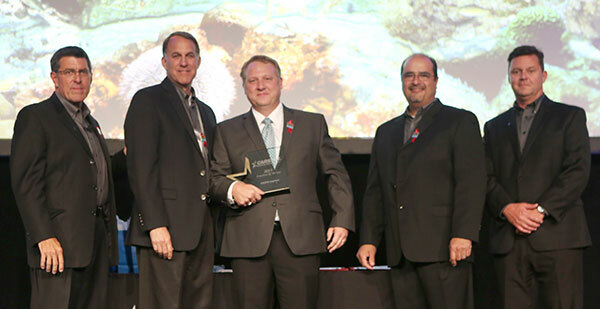 The Rookie of the Year was CARSTAR Friendly of Roselle in Roselle, IL, which is run by Body Shop Director, Eric Schmit. This award is given in recognition to a new CARSTAR franchisee as it gets “up and running” with CARSTAR. To qualify for the award, a franchisee must have been with CARSTAR less than three years, be well underway toward achieving Tier 1 compliance and enthusiastically embrace the CARSTAR culture with active participation. The award for Business Group of the Year goes to the CARSTAR Puget Sound Business Group, which represents 22 stores throughout the region. CARSTAR offers business groups throughout the country to provide storeowners opportunities to share best practices, address local issues and conduct market-wide advertising and branding programs. The Next Generation Award honors a second or third generation CARSTAR owner who is excelling at leading a family business. For 2015, the Next Generation Award was presented to husband and wife, Tony and Sharon Kempen, who run CARSTAR Pat’s Auto Body in Plover, WI, and CARSTAR Eau Claire South, in Eau Claire, WI.